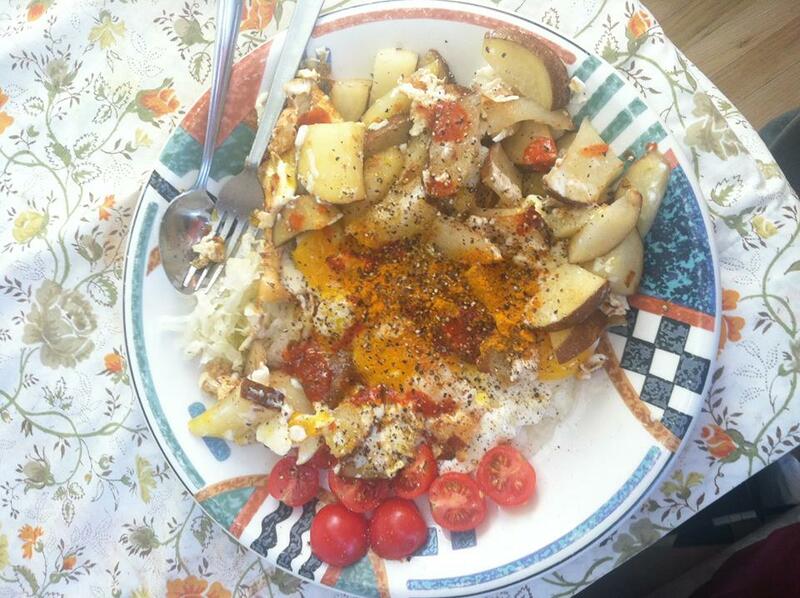 For most meals, I find deciding what to eat and preparing it burdensome, but my breakfast I look forward to cooking and eating every morning. I already feel excited tonight that I get to prepare and eat my breakfast tomorrow morning, even while I eat the same breakfast every morning, pretty much. Butter a pan and add sliced potato to fry on medium heat. 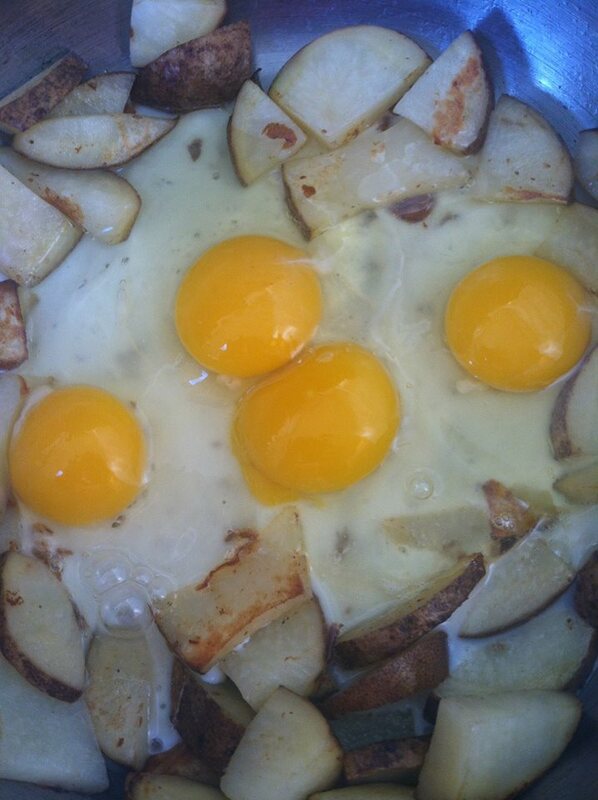 Once potato pieces are almost fully cooked, add a sliver more butter to the pan and crack 4 eggs in, without scrambling. 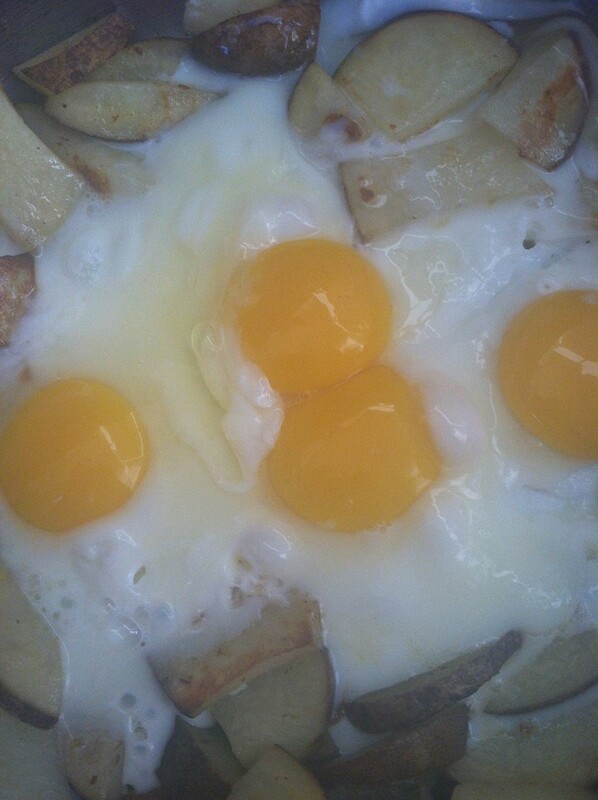 Turn heat to low and cover the pan so the eggs cook but stay runny. Slice organic baby tomatoes in half and put them on a plate with the butter, sauerkraut, miso and olives. Once the egg whites are cooked, use a spatula to place them and the potatoes (still in the pan) on the plate on top of the other goodies. Are you excited about breakfast yet? Learning what foods I do best with is an ongoing process, something ever evolving, something I have been working on for as long as I can remember. Making the connection between what we eat and how we feel is an important step on the path of freedom from psychiatry and psychiatric drugs. What foods excite you, ground you or make you feel good? How much have you explored nutrition as an alternative to psychiatry? This will be one among many topics covered in my book Breaking Free From Psychiatric Drugs, designed to give you all the tools you need to make a complete getaway, in your own time. Please join our book launch campaign to make sure this book can happen! I never watch what I eat until now I’m a mom of two school-age kids, I do want them to have a good start in the moninrg. Our schooldays breakfast menus include:- hot steel cut oatmeal w/ flaxseed meal & drizzled w/ raw honey- multigrain toast drizzled w/ raw honey- “made from scratch” blueberries pancake w/ flaxseed meal- 1/2 avocado sprinkled w/ course salt & lime juice- bran flax or plain multigrain cheeriosOne of the above plus the following to complete one breakfast:- 1/2 hard boiled egg- low fat milk- 1 serving of fruitI hope this is a dietician-approved menu but certainly moms-approved :). Keep rotating these every weekdays I do feel like I’m running out of ideas!Enjoy your blog very much, particularly like your portion control. Keep up the good work!